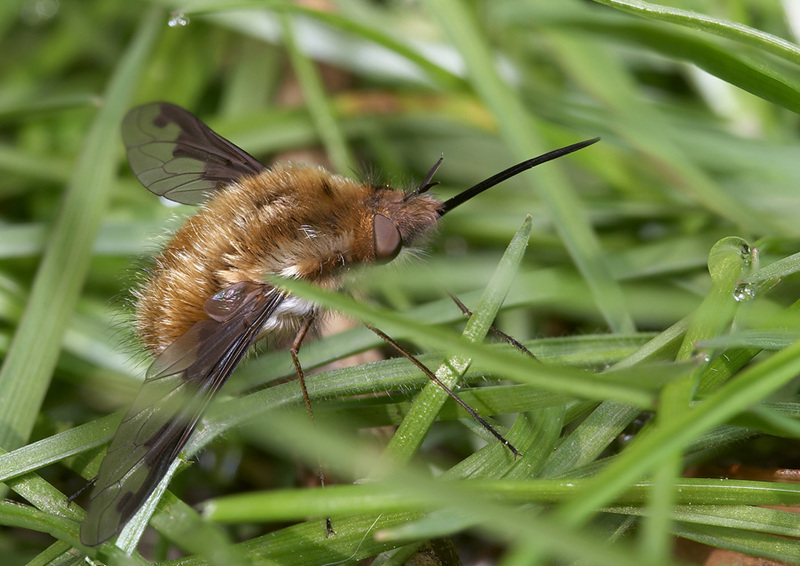 Not sure if it helps- here's a pic of what I think is Bombylius major I took yesterday South coast UK. Probably, but to be certain we should know the colour of the hairs on the venter. These are dark in B. discolor and pale in the similar B. medius. Last year I had B. major on 10 April 2005 in a garden. I have less information on what is meant to be the commoner of the two species in England. And it probably is commoner! 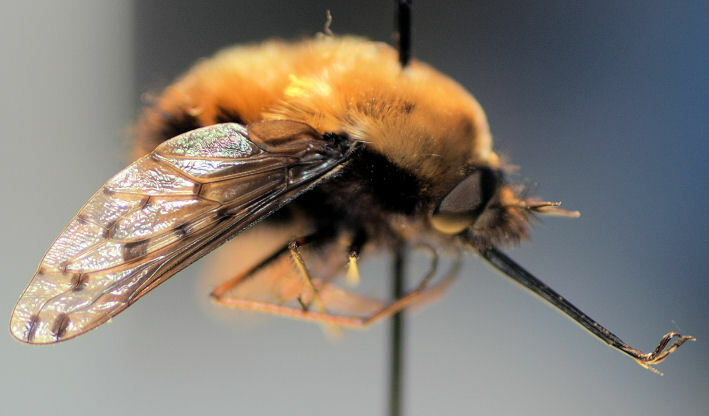 Has anybody else got other Bombylius photographs from northern Europe (at least two other species) they can post on this thread to make a useful reference please? The two species in the same genus are the ones most interesting to compare. 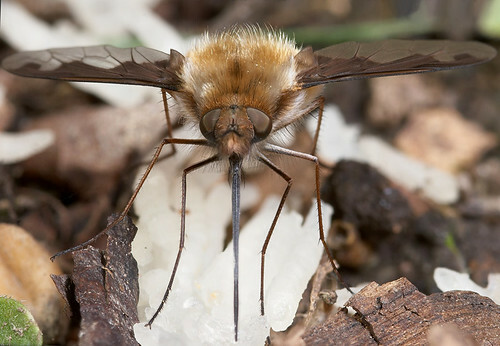 Has anybody spotted any ordinary Bee-flies B. major, this year? All the reports have been of B. discolor! 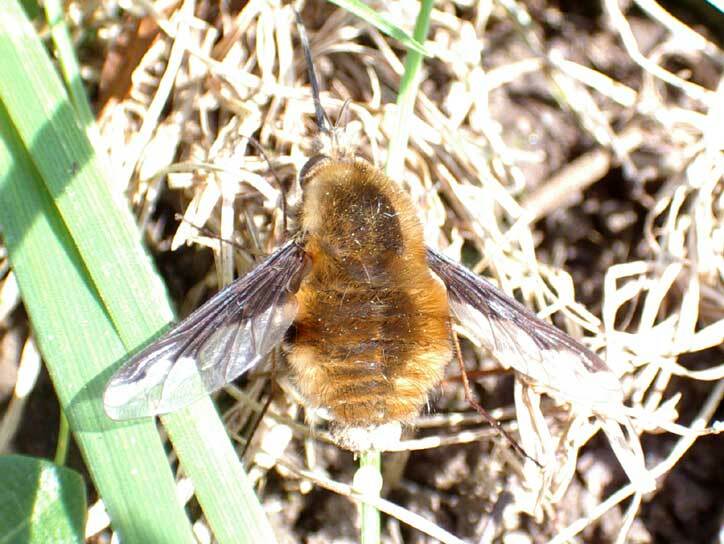 I have not seen bee flies but then again, they are pretty scarce in my part of the Netherlands... But as far as I am aware, B. major is the commoner of the two species and, conseriring Britain as a whole, I think it should be the commoner there, too. Both species are certainly active in my part of East Sussex on the south coast of England. This year is the first time I have seen B. discolor, a nationally scarce fly to Britain, in my area. There again I have only been looking since last year. Loads of Bombylius major flying in Shropshire - central England. This is curious as in many places where I have seen Bombylius there is little evidence of the host Andrena mining bee. Certainly no sign of B discolor in these parts! Here's another pic from a couple of days ago. I saw my first B. major on 22 April 2006 in sunny Sussex. Not very good image so I will not post it. The black line on the wing could be seen easily without the aid of magnifying equipment. Could not get out int eh sunshine yesterday and now it is raining. PS. 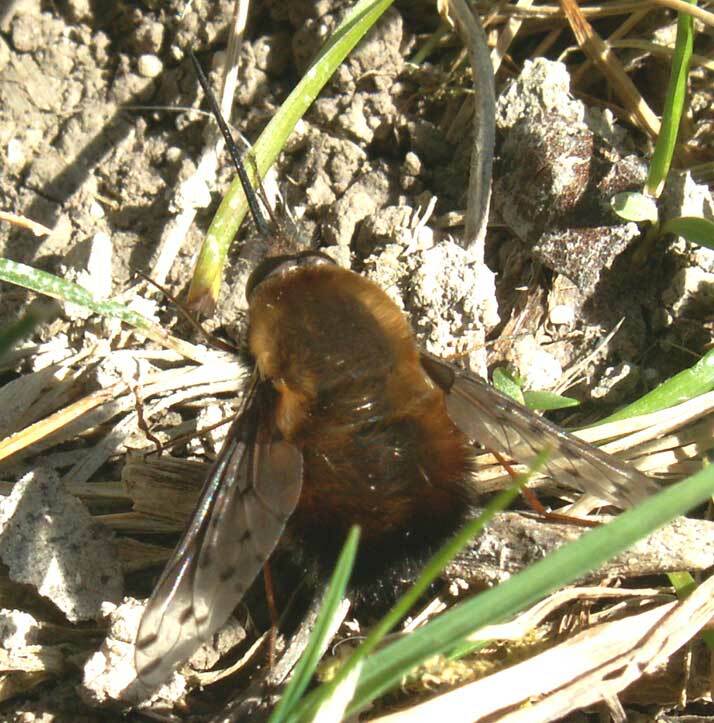 A few days ago (8 April 2006), I saw scores of Andrena flavipes locally. Have we got dates that B. major was first recorded this year please? Last year I made a note that the first one I saw was on 3 April 2005 in Sussex. First pic I have of one In Worthing Sussex was on 5th April 2006. As early as last year then. I was hampered by observer opportunities this year. Bee flies do not visit my garden. I have to go to them. Butterflies are late this year, but Bee-flies are on time or thereabouts? or were they earlier last year? (my first record was 3 April 2005).